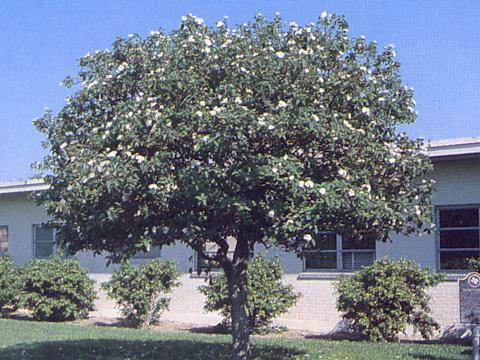 Small tree with large leaves and showy, white flowers. 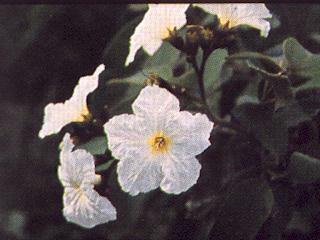 Flowers: Large, showy and white with yellow throats, trumpet-shaped. Fruit: Fleshy, white berry resembling an olive. Foliage: Deciduous, velvety, 4 to 5-inch-long leaves. Sun: Full or partial shade. Water: Moderate; drought hardy once established. Maintenance: Fleshy fruit messy if crushed on concrete. Cover, nest sites; fruit used by birds and other wildlife (deer, javalina), livestock. Edible fruit (in moderate quantities); jelly used as cough remedy; leaves used to treat rheumatism and bronchial disorders. Stark contrast of beautiful white tissuelike flowers to the soft velvet dark green foliage will dramatize an entryway, courtyard or secluded area.